Remember the chap in the middle? young entrepreneur and last years finalist on ‘The Apprentice’, Nick Holzherr. 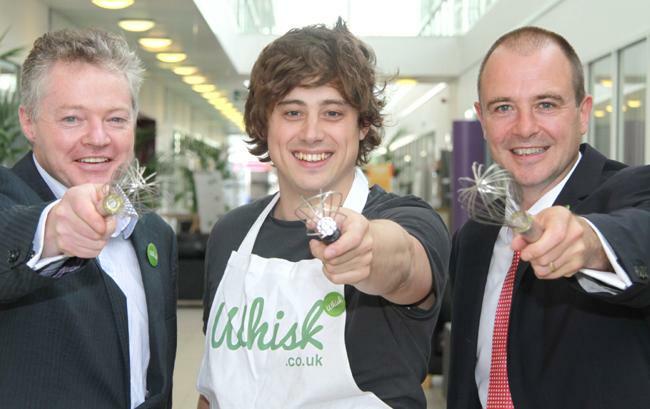 Following the apprentice Nick has officially launched his own business, Whisk, despite Lord Sugar’s rejection during the show. Nick has developed a free web and mobile app allowing users to match recipes and make purchases within seconds from online shopping. During the show, Lord Sugar was quick to present his opinion to Nick, stating ‘Who could be bothered with it?’ Sugar’s suggestion however failed to stop Nick follow his dream of developing the app. After the show investors wasted no time in providing around £500,000 to help Nick’s business venture take-off. Nick said “I know I’d prefer to spend my free time in the kitchen cooking for friends and family rather than traipsing around a supermarket trying to find the ingredients I need. He said: “Whisk means when I see a recipe I like, I can quickly add it to my online shopping basket and know I’ll have everything I need to prepare it. Who hasn’t had that frustrating moment when you realise you’ve forgotten the key ingredient that the dish just can’t do without? Interested in putting Nick’s ideas to the test? Find the app available on itunes, or by logging onto Whisk.